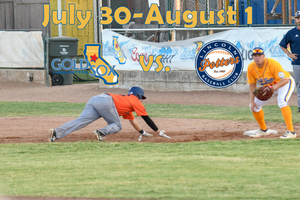 MARYSVILLE, CALIFORNIA: MONDAY, JULY 30, 2018 - The Yuba-Sutter Gold Sox will take on the Lincoln Potters tonight through Wednesday, August 1, 2018 at Colusa Casino Stadium due to a schedule change. The Gold Sox were originally scheduled to play the Klamath Falls Gems on these dates and the Lincoln Potters were to travel to Medford to play the Rogues. The Klamath Falls Gems have lost several players due to the loss of their homes in the Carr Fire in Redding, Ca. “Our thoughts and prayers go out to these guys and their families dealing with this loss right now”, Vice President/General Manager Michael Mink said. Safety of the players is the number one priority. Just one week ago the All-Star game in Klamath Falls was cut short by poor air quality due to smoke. Tonight is sponsored by Alaskan Brewing Company with $5.00 beer specials and a raffle for some really great prizes. The raffle prizes include a Golf Bag, Smoker, Paddle Board and more! Raffle tickets are 1 for $1, 7 for $5 and 15 for $10. Tuesday, July 31, 2018 is Toss Back Tuesday and Host Family Appreciation night. There will be games and prizes courtesy of Not Your Father’s Rootbeer and a ceremony giving thanks to all of the families that have hosted our players this season. Wednesday, August 1, 2018 will be Fan Appreciation Night with free fan prizes and giveaways all night long to celebrate the final home game for the Yuba-Sutter Gold Sox and the fans who support them. Gates will open at 6:00 PM and games will start at 7:05 PM each night. General Admission: $6.00, Premium: $10.00m and VIP: $12.00. The Great West League is one of the premier summer collegiate wood bat leagues in North America, providing a professional, minor league baseball atmosphere for top college players seeking professional baseball careers, while providing affordable family entertainment and enriching the quality of life in its member communities. Gold Sox season tickets and advertising packages for the 2018 season at Colusa Casino Stadium are available now. For questions about the 2018 season, please contact us at (530) 741-3600, by email at team@goldsox.com, or in person by stopping by the Yuba-Sutter Community Baseball Office located at 429 10th Street, between 8:30 a.m. and 4:30 p.m. on Monday through Friday. For more information about Gold Sox Baseball, visit us at www.goldsox.com.